My summer reading list is heavy with non-fiction: I'm trying to become more informed in two particular subject areas: Buddhism and anarchism. But my study habits aren't terribly disciplined and I've snuck in a few mindless indulgences, just for fun. I'm currently reading two brand-spankin' new publications: Noah Levine's The Heart of the Revolution (2011) and Property is Theft! : a Pierre-Joseph Proudhon reader (2011), edited by Iain McKay. The Heart of the Revolution, Levine's latest book, is getting a lot of attention in Buddhist circles (search #theheartoftherevolution on Twitter) and even has its own discussion page on the Tricycle website. Although both authors draw on ideas and practices that have been around a while (the Buddha lived 2500 years ago, Proudhon died in 1865), Levine and McKay ably demonstrate the vitality and relevance of these figures in our own time period. After having been recently introduced to the genre of Scandinavian crime fiction, I've discovered Yrsa Sigurðardóttir's Thóra Gudmundsdóttir series. The second in this series, My Soul to Take (2009), is now beckoning to me from my bedside table. Although this genre is completely new to me, I was attracted by descriptions of the main character, Gudmundsdóttir, whom Sigurðardóttir has conceived as a lawyer, investigator, and single mother. 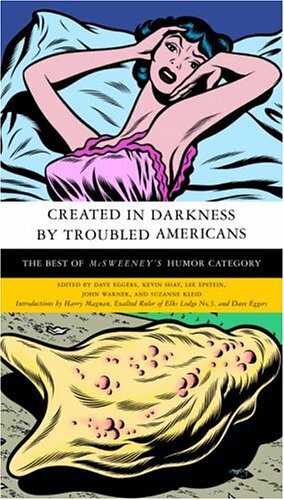 For husband, I brought home a copy of Created in Darkness by Troubled Americans: the best of McSweeney's humor category (2005), edited by Dave Eggers [et al.]. He's been reading me the best bits (including, "Words That Would Make Nice Names for Babies, If It Weren't for Their Unsuitable Meanings": e.g., Feta, Calorie). I think I'll have to look through it myself before I return it to the library. I thought I'd kicked my spy thriller habit after The Nearest Exit (2010), the second book in Olen Steinhauer's Mo Weaver trilogy (at least until number 3 comes out), and then I came across Otto Penzler's dramatically titled collection Agents of Treachery (2010). [Cue dramatic music] *DUN DUN DUN! * Steinhauer is included here (yea! ), as are stories by Lee Child and Stella Rimington.